See below for important information regarding changes to database indexes in the new version and steps you may need to take prior to running the V7 upgrade. DNA Fusion version 7 has had a significant amount of work done to the database and its indexes to improve performance and improve overall efficiency. While indexing changes are not uncommon, version 7 requires the Transactions Table Indexes to be updated. The Transactions table typically stores large amounts of data and therefore must be treated differently due to its potential size. Please read the installation notes below carefully to ensure your upgrade goes smoothly. This depends on the size of your site and server specifications. Most customers (with less than 10 million rows in the transactions table) will be able to simply run the upgrade installation and re-indexing will be handled during the install process. Some customers and larger sites with over 10 million records in the transactions table may require up to 1-2 hours to perform the re-indexing. Because of this, handling the upgrade with the standard SQL upgrade script could be an issue. Open Options built the V7 indexing utility so that it can be run from within the install (smaller sites) and as a stand-alone utility so that larger customer sites can perform this upgrade in a separate step prior to the main upgrade or as a scheduled task during off hours. How do I know my table size? 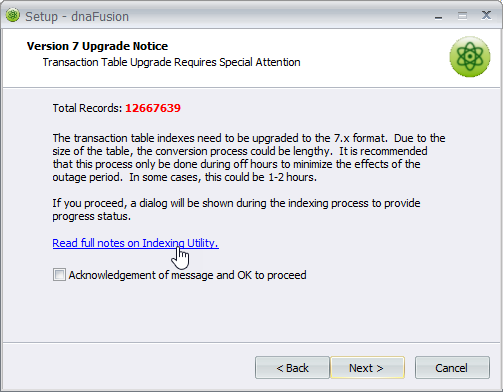 During the upgrade process of existing DNA Fusion servers, you will see the "Version 7 Upgrade Notice" dialog like the one shown here if your database contains more than 10 million records. If your database contains less than 10 million transactions the upgrade will proceed and indexing will be automatic. No further action is required. If you do see this dialog, it is recommended that the DNA Fusion Indexing Utility be run prior to upgrade or scheduled as a task to run off peak hours. Version 7 introduces the concept of “Index Schemes” and there are currently two schemes supported. The standard/default scheme works much like the current pre-7.x indexing, albeit with different columns and names. This is adequate for the majority of sites and works well. The Aggressive scheme can provide much better performance, however that comes at a cost of disk space and indexing time. Typically, you can expect to double the amount of disk space being used with the Aggressive scheme so not recommended for locations already low on physical disk space or sites using an “Express” version of SQL that have a capped database size. NOTE: To use the Aggressive scheme, you must manually run the DNA Fusion Indexing Utility. See below for more information. 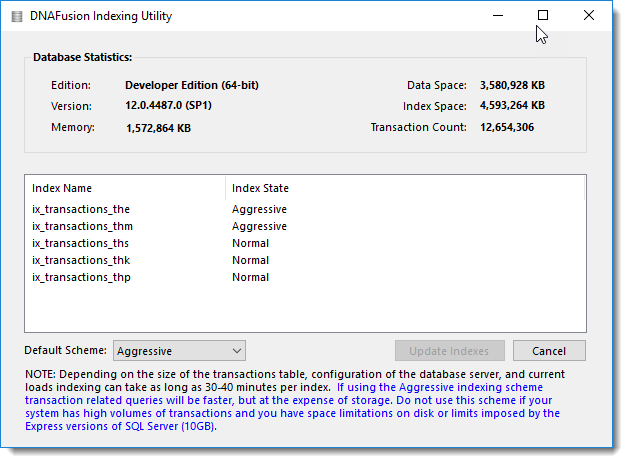 The utility shows the version of SQL the DNAFusion database is running under, current space used by database tables and indexes, and how many rows are currently in the Transactions table. Time to index is dependent on numerous factors including version of SQL Server, current load, type and speed of the computer SQL Server resides on, memory allocations, etc. The following benchmark test was performed using SQL Server 2012 with 1.5GB of RAM allocated to SQL Server. The results can be considered as a baseline, but some sites may be slower and some faster. These results reflect the total time (H:M:S) for all 6 indexes to be built. IMPORTANT: The manual indexing process should not be done without subsequently upgrading DNAFusion to V7. Doing so will cause the system to run slowly and unpredictably. If scheduling after hours, be sure to follow up with the V7 upgrade first thing the next morning. To manually run or schedule the DNA Fusion Indexing Utility click here to download. *Set security options in the utility to be a user with administrative rights and full access to DNA Fusion and check the box to "Run with highest privileges". If scheduling to run off peak hours click the arrow on the Update Indexes button to see menu options. If Schedule Task is chosen, by default the task is scheduled to run at 2AM the following morning. If you have any questions regarding the upgrade process, please contact your Dealer of Record (DOR). If you are a certified Open Options dealer needing assistance, please contact our tech support team at 855-818-7001 or via email.